The Sleep-EzzTM AR (Acid Reflux) Bed is designed specifically for the treatment of Gastroesophageal Reflux Disease (GERD),more commonly known as Acid Reflux. This product greatly reduces Acid Reflux by allowing the body to remain straight, while elevating the upper body up to 8 degrees. Keeping the body straight relieves pressure on the abdomen and stomach. Raising the head to this angle helps keep the food down in the stomach, reducing the chance of it and acid from moving up into the Esophagus . The Acid Reflux Bed can also be reversed to allow for Trendelenburg treatment by raising your feet above the heart to increase circulation. The details in the manufacturing of the Sleep-Ezz bed sets it apart from comparable beds on the market. The base of the bed is made from 3/4", 11-ply, industrial strength plywood. 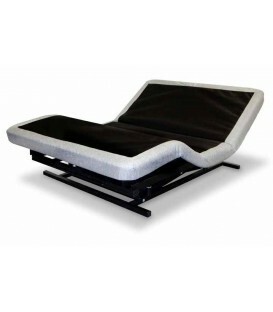 The frame is constructed from all cold rolled steel, making the Sleep-Ezz frame twice as thick as most other adjustable beds. Other features such as the 11-gauge steel gusset plates at the bed's pivot points and the 14 gauge, 1" x 3' tubular steel side rails assure that the bed will provide you support and comfort for years to come. Your options of what you need for a comfortable night's sleep are met with the Sleep-Ezz adjusable bed. Aside from the multiple positioning options that you get from the dual motor design, you have your choice of seven different mattress styles that you can use with your Sleep-Ezz base. These choices include a dual plush option that provides both a soft side surface and a firmer sleeping surface when turned over. All Sleep-EZZ beds meet and exceed the flammability mattress code 16 CFR 1633. Lifetime warranty on frame and five-year warranty on mechanism and all electronics. Specially designed, heavy duty motors providing years of service. Heavy duty, rolling casters with locking capabilities. Heavy duty, wired remote hand control. 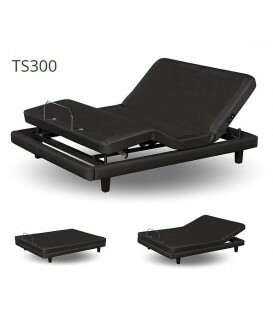 The AR Bed can be reversed to create a Trandelenberg Bed, which elevates the feet above the heart. 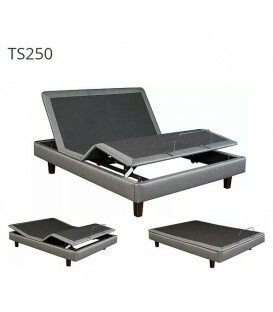 Distance from base of bed to floor is 15"
All Sleep-Ezz Adjustable beds are covered with a LIFETIME warranty on the steel frame and a Five (5) year parts and labor warranty covering all electrical parts and wooden mattress base. Should any part malfunction or fail during the warranty period, Med-Lift will repair or replace said part. Med-Lift will also pay the labor to repair or replace the part, if work is performed by a Med-Lift certified warranty center or an authorized Med-Lift dealer, according to Med-Lift's service fee schedule. Med-Lift does not cover any trip or mileage fee charged by the dealer or warranty center. If the item under warranty is required to be sent back to Med-Lift's factory, the retail purchaser will be responsible for any and all freight charges to and from Med-Lift's facility. All Made in the USA!!!!!!!! The Sleep-Ezz Acid Reflux Bed helps to reduce the moving of acid up the esophagus by placing your head in an elevated position while you sleep.